My dad has been at Silverado Escondido for about seven months. He is a little bit difficult to take care of and we chose this place because they have a reputation for taking in difficult residents. I don't particularly care for the place that much. The amenities aren't very good and they don't have much. The residents really don't get out much as far as travelling. They have a lot of staff at times, but sometimes they're short on staff. I also don't see my dad getting a lot of mind-stimulating activities. The dining area service is good though. The facility is kind of older and it's been around for a while. The food is not the best. Thank you for taking the time to leave a review and share your experience. At Silverado, we put an emphasis on resident social interaction and engagement. On-site activities, such as cooking classes in our community bistros, and resident outings to local attractions help create a sense of normalcy and purpose.These engagements help prevent boredom, boost confidence, develop friendships and provide opportunities for new experiences. We appreciate your feedback and are happy to discuss any additional concerns. Please reach out to Silverado Escondido Administrator, Jolene Farish, at 760-737-7900. My husband had stayed at Silverado Escondido. It was way too large, way too many residents, and not enough caregivers because there were so many people there with dementia and Alzheimer's. I thought it was a very fine institution for people who were in wheelchairs or were very calm and quiet. My husband was mobile, ambulatory, and he's up on his feet, but they did nothing to keep him busy. He just wandered up and down the halls. It was just not a good place for him. I was not saying it would not be good for other people, but it was not good for him. The room was clean but it they couldn't keep track of his belongings or his clothing. We lost a whole lot of his clothes and we lost his watch. It was also quite expensive. The food was fine. There was on complaint about the food. Thank you for taking the time to leave feedback. 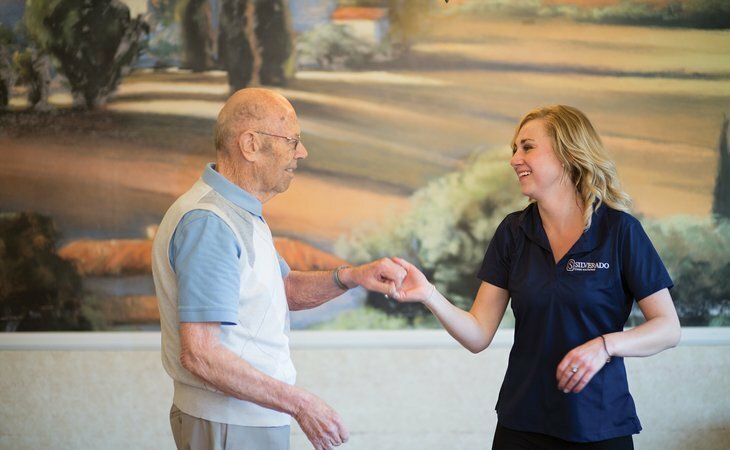 With 18 years of memory care expertise, we take pride in being a leader in memory care. We're sorry to hear that you felt Silverado was not the right fit for your husband. Please always feel free to reach out to us directly to discuss this further. Thank you again. I have my husband on a waiting list now for Silverado. When I first talked to them, they sent me the book on how the whole Silverado came into being from the two gentlemen who started it with their philosophy on care. It was so impressive. When I did visit it, it just had such a good home feeling where people can bring their pets. There were a couple of little dogs running around. Very clean, a nice outdoor area, and their philosophy of trying so hard to fit every resident's need according to each one and each person's own personality and the likes and dislikes. They appear to really truly help the people have better lives when they have dementia. I had a very positive feel about it. The only drawback is it's very expensive. They were so nice, so friendly, so supportive. There were no odors of any kind. It appeared to be very clean and well maintained. They showed me everything: the rooms, the indoors, outdoors, the dining room. Most rooms are shared. For each person, outside the room, they have a nice-sized shadow box to put all kinds of old mementos about the person, and I thought that was really nice. My husband has quite a few medals from when he was in the Army, and so hopefully he will be able to look at those and remember how that has a connection because he knows how he got the medals. It also was a way of sharing their lives with other people. I have visited many nursing facilities, and I must admit that this facility is beautiful, clean and the customer service is the best. A positive atmosphere is important to me and my family, all the staff seemed more than willing to offer any support needed, they also take their time with the residents and genuinely seem concerned for the well being of each resident. The kitchen looks like a mini luxury dine in area, it is clean and again the staff members are so helpful. During the time that the nurses give out the medication, the nurses always respect and honor the freedom of the residents, I have been to some facilities were the staff are aggressive and forceful. I also like that the nurses respect the privacy of the residents and take in consideration that their health is not a group matter but a one on one matter. The only complaint I have is that there are not enough outdoor activities offered, the residents would enjoy getting out together without having to worry about transportation. Silverado Escondido was truly one of the best Assisted Living Communities I have ever seen. As a nurse, I have had opportunity to visit many different facilities, but none match what I encountered at this facility. Never before have I seen a Director of Nursing actually giving patients their medications themselves. Each and every staff member knew each patient's name without hesitating. The facility allows the residents to bring their own pets in, and have some pets of their own for therapeutic healing. The residents are free to come as go as they please within the facility, and with the facilities safety precautions, there have been few minor injuries. Many places chemically and physically restrain their patients, but Silverado NEVER does. This is truly how every Assisted Living for Alzheimer's and Dementia patients should be. Hands down the best place I have ever visited in this category. The Silverardo philosophy as they provide care for dementia patients is quite extraordinary. The culture truly reflects the belief that love is stronger than fear. There is a commitment to trying to maximize the freedom and quality of life no matter the degree of impairment. The staff from top management to personal care attendants try to make good on this promise. At times things may seem a bit worn or chaotic but that is because the facility works so very hard to avoid the sterile institutional feel of so many facilities of this kind. This place feels like a loving home. The skilled, compassionate memory care professionals at Silverado are dedicated to providing residents with the dignity and care they deserve while they enjoy the community's warm atmosphere. Comfortable surroundings and engagement activities designed with the needs of memory-impaired individuals in mind help ensure the goal of enriching the lives of both residents and their families. What should caregivers and potential residents know about Silverado Escondido?